Appearance: 6′ 5″ tall, lean build. Grey fur with leopard print, he has a white belly, white paws that extend down the bottom of his arms, and a black tipped tail and black rimmed ears. He has retractable claws. Clothes: Odin usually wears loose fitting pants with a belt, and a baldric to keep his weapons. Sometimes quiet and under spoken, Odin Canis is a mild mannered hybrid aboard the Feralys. Although hard working and strong, he often finds it difficult to strike conversation among others aboard the ship. He is passive about his role as a gunner, aspiring to reach higher positions on board. When not preoccupied with his duties, he can usually be found accompanying Rubian or drinking. Odin spent his earlier years on the Leopard Islands, where he was born in a monastery to a snow leopard priestess. His birth was unintentional, but the result of a raid, in which one of the enemy wolves forced himself upon the priestess. Because this hybrid birth was not in accordance with the monastery’s beliefs, Odin was given the last name Canis, and was shunned among the elders and his peers. At about 12 years old, the monastery fell victim to another raid of wolves, but this time his mother was killed in the attack. Torn that he survived and could not protect his mother, he swore to train to defend his loved ones. Despite this, the monastery feared his wolf blood, and Odin was no longer allowed to live in the monastery after the death of his mother. He was sent away, where he found work with the local traders. 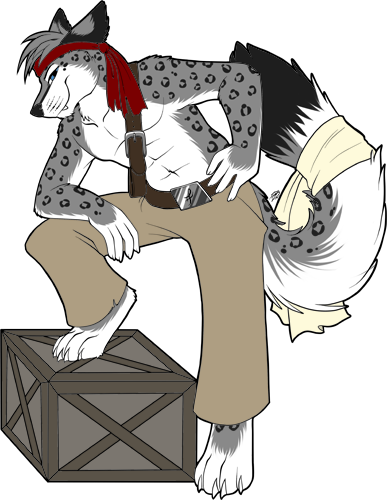 On one of his trips to Mangora, he learned of a band of pirates recruiting for their ship. Interested in a change of lifestyle, and the importunity to train, he hastily joined the crew.